Go where the fish thought they could hide. The Colorado Pontoon by Classic® lets you get to hard to reach bodies of water and find those new honey holes. Ample amounts of storage including 12 zippered pockets and 10 mesh pockets so you can take what you need for a full day on the water. 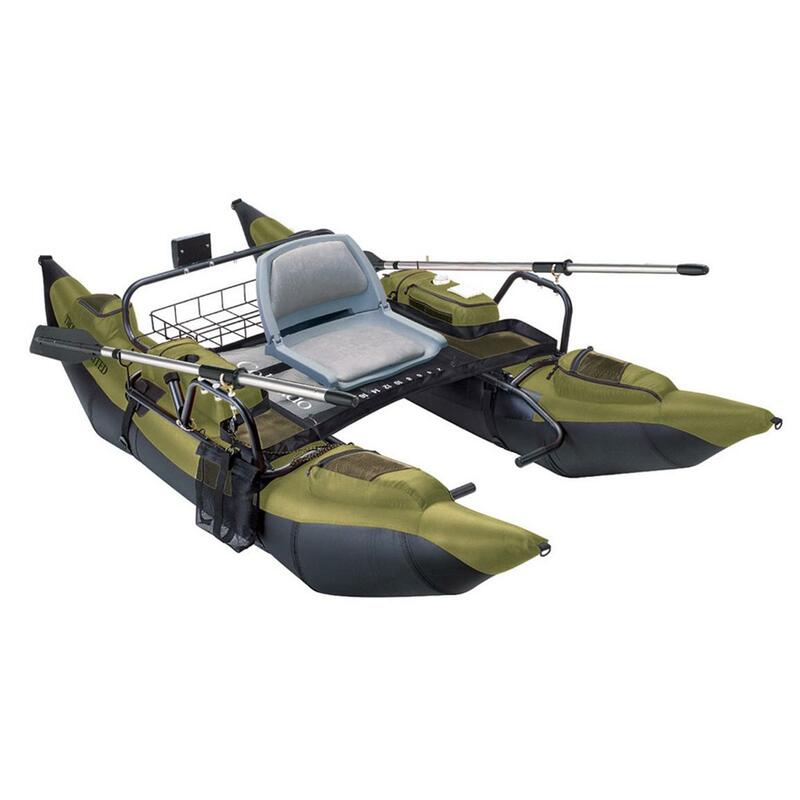 A wire rear storage platform holds a battery to power an electric trolling motor or you can rely on your power with the three oar-lock positions and a pair 7' aluminum 2-pc. oars. You can also place your tackle box or a cooler to keep them close by. The Colorado Pontoon has 9' pontoons with quick inflation/deflation valves, a 400-lb. capacity and Class 1 river rating. Once you've reached a location, drop the fillable mesh anchoring bag and lock it off with cleat and pulley controls that can fit on the right or left side. A rod holder attaches to the right or left-hand side of the frame and 2 insulated drink holders will keep refreshments close by ... who would've thought a personal Pontoon could offer so much storage and convenience? The 9' Colorado offers up a great way to fish those not-so-accessible waters without sacrificing the things you need to make your outing successful and fun! Total dimensions: 108" x 56" x 26"h.
Classic Accessories Colorado Pontoon Boat is rated 4.8 out of 5 by 21. Rated 4 out of 5 by Roger L from Great Pontoon The pontoon was very easy to assemble. Took it to a lake close to my home, put a trolling motor on it and found that it was hard to control with the trolling motor behind me. The pontoon worked very well for fishing and maneuvering around the lake. The next day I installed a swivel under the seat, so that I could run the trolling motor. the swivel seat made this pontoon an excellent maneuvering unit. I would have given this pontoon five stars if it would have come with a swivel seat. Rated 4 out of 5 by C.sizzle from Very nice and fun. Easy to fish from. I use it for fishing and it works great. Lots of room and storage. Rated 5 out of 5 by Travis from I love it! I haven't had a chance to put her in the water yet but I'm confident it will do what I ask of it & then some. I bought one for my dad too & we can't wait to hit the river. Rated 5 out of 5 by MikeF from Exceeds expectations! Am so happy with this pontoon boat. I did a fair amount of research before purchasing; I thought I might need the wheel provided in the XT model but so far I've not wished that I had it. I outfitted mine with the Minn Kota Endura 40x thrust electric motor, and even with the extra weight of the battery/motor, I still sit high on the water and can fly fish without issue. I feel very safe when I'm on the water, and can actually sail pretty quickly in high gear. And the anchor system works great. I love this thing. Rated 5 out of 5 by Flraptor from Retrevial Boat I got my Colorado last week to use as a Retrevial boat for a RC boat club I belong to. I was very pleased with the quality and ease of assembly, I read a few reviews that said the pontoons leaked. I'm pretty sure it was just a case of people not working the valves correctly, these valves have a double seal so it's almost impossible for them to leak unless they are not worked properly. I put a 55lb thrust trolling motor on mine and I probably have the only Colorado that almost gets on plane! LOL I know it says 30lb max but it has no problem with 55lbs. Great boat deffinetly buy one! Rated 5 out of 5 by Footr from very easy assembly, good instructions assembled and dis assembled 2x. Don't need instructions any more. Jeep in to remote spots, hope to get in with it on the top. cant wait for ice off!